Mannheim, 12 April 2019 – At this year’s SAE World Congress in Detroit (9 to 11 April), Röchling presented its latest development in the field of aerodynamics, the AeroSUV, to an audience of international experts. Röchling developed the generic AeroSUV in conjunction with the Research Institute of Automotive Engineering and Vehicle Engines Stuttgart (FKFS) at the University of Stuttgart, Germany. It is a 1:4 scale model that combines the legal definitions and design details of medium-sized SUVs. 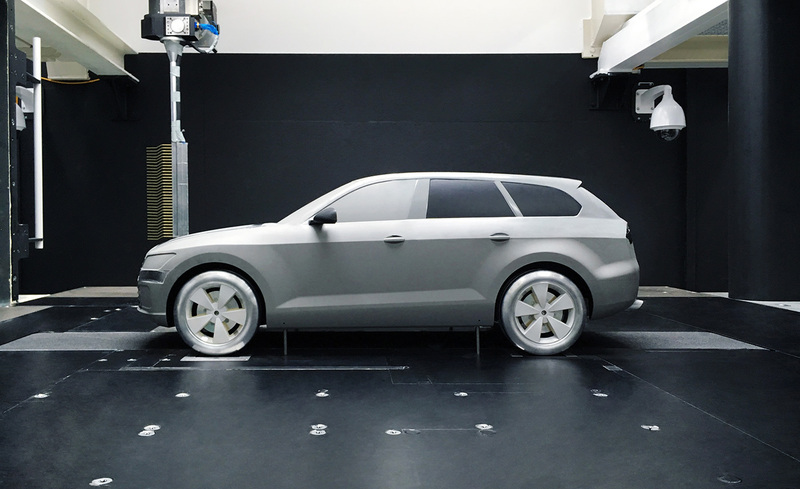 The model allows for far-reaching flow simulations and wind tunnel tests to optimize flow in a vehicle’s pre-development stage. It also provides a unique opportunity to compare different flow scenarios among a variety of software packages and with the wind tunnel tests. The SUV-specific geometrical parameters include a higher ground clearance as well as wheels and base bodies that are considerably larger than those of other passenger vehicles. Currently, in the EU and the US, there are no legal specifications to reference when it comes to these parameters. Therefore, in order to realize an initial design, current models of the SUV segment were examined. Developers set out to map the vehicle’s level of detail and achieve realistic aerodynamic coefficients. To do this, engineers optimized the initial model geometry using Computational Fluid Dynamics (CFD). Wind tunnel tests performed using the AeroSUV showed the extent to which the specific parameters affect the flow characteristics. Factors traditionally posing the greatest challenges are the underbody design, ground clearance and the wheels, including the wheelhouses. By performing pre-development tests with the AeroSUV, Röchling is able to provide automakers with numerous options for optimizing future vehicles.